Printed from http://www.bodytalksystem.com//learn/news/article.cfm?id=1079 on Apr 20, 2019. Earlier this year, I returned from my travels in the Philippines having witnessed the strong commitment of BodyTalk Outreachers. I was and continue to be humbled and impressed by their efforts to bring BodyTalk Access to the neediest communities, amidst challenging social and political situations. In the photo documentary below, you will see photos of Outreachers taken this past spring in Teresa, Rizal, as well as photos from August 2017 when Outreachers worked with refugees from the devastating Battle of Marawi in the large southern Philippine island of Mindanao. Neither the scorching summer heat nor the sound of falling bombs deterred the intrepid team of Outreachers. 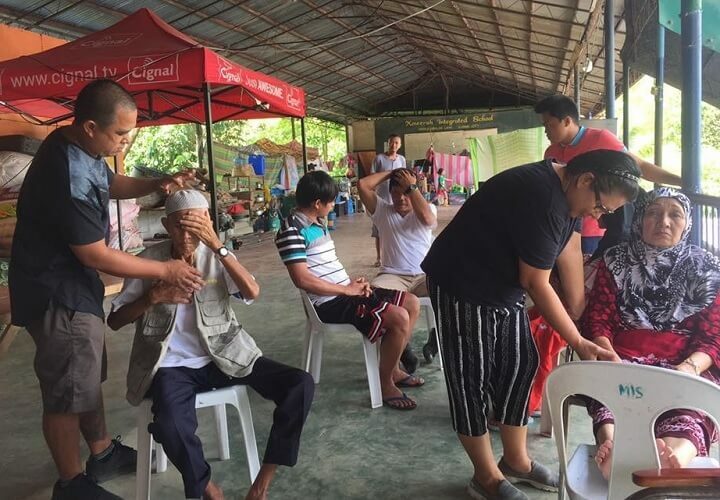 The photo above shows the Filipino team on an Outreach mission to an under-served community in Teresa, Rizal, a town about 60 miles outside of Metro Manila. 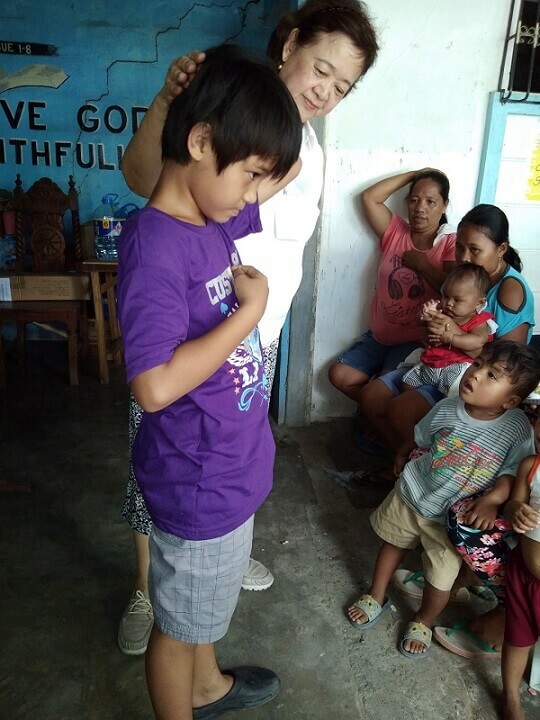 Outreacher and BodyTalk Philippines president Annie Lao wrote: "It was a hot day! We had 30 to 33 people, mostly mothers with their children. We let them join, and the little ones we put in an area where they could be looked after. The pastor had to bring some of the community leaders using his motorcycle. We taught from 9:30 to 12:00 at the first meeting on April 26 and covered these topics: Cortices, Switching, Hydration, and Body Chemistry. But since it was very hot, we had to stop and serve lunch so people could go home. We told them to practice at home and said that at the next meeting, we would finish the lessons--beginning with a review, then sharing testimonials, and continuing with the Reciprocals and Fast Aid--and hopefully hand them their certificates. We picked one person from the class to sponsor to take a future full Access workshop, and we also kept the option open to come back to work with the same group and hopefully with others from their sitios (villages)." Annie Lao, at left, invited children to join their mothers at a BodyTalk Outreach venue at a local Christian church. As President of the Philippine BodyTalk Association, Annie continues to seek capable and committed Outreachers for work in healthcare in the Philippines. The photo below was taken on May 3, 2018. 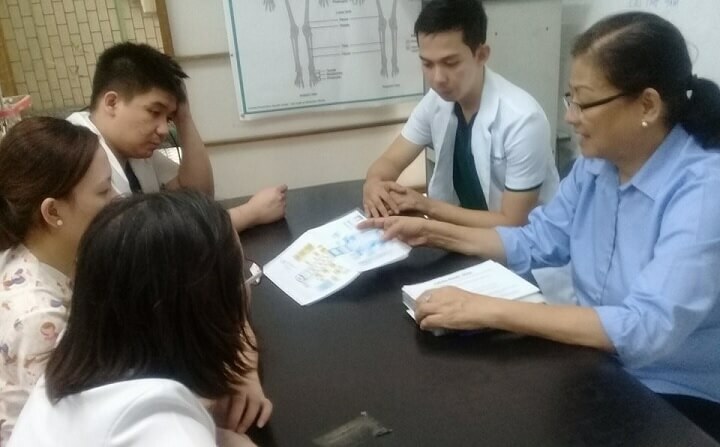 In it, BodyTalk practitioner and Access Trainer, Gina Lee (read her IBA bio), meets with medical interns from the prestigious San Juan de Dios Hospital to prepare them for volunteer work at the BodyTalk clinic at the Our Lady of Remedies Parish in Malate, Metro Manila. The Columban priests have strongly supported the BodyTalk clinic. 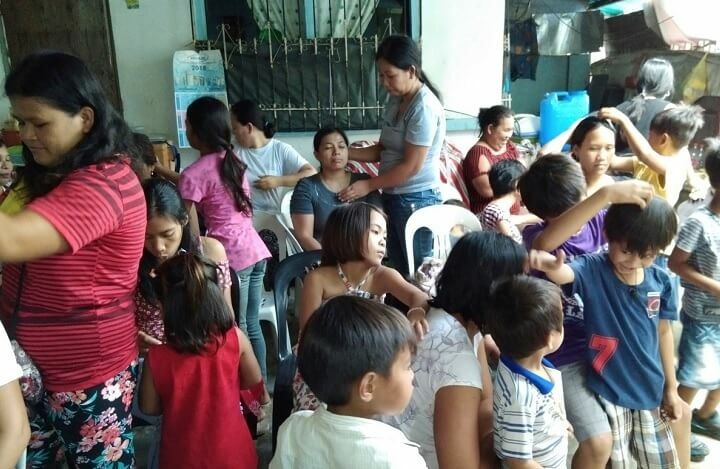 Requests for BodyTalk Access Outreach throughout the Philippines are many, but the most dramatic mission was to a war-torn area in the southern Philippines, where ISIS and Philippine government forces were engaged in fierce fighting from May to October 2017. The city of Marawi has been devastated since then, and the World Bank estimates that 1.5 billon dollars is needed to rehabilitate the city and its population. In the photo above, taken during the battle in August 2017, Outreachers Remar Soliza (read his IBA bio), Alan Along, and Gemma Bunag work in makeshift tents along Marawi's fringes administering Access and full BodyTalk sessions to refugees, a few from among some 2,000 people (out of a total of about 360,000) who fled the city of Marawi to outlying makeshift tent cities. "We could hear bombs falling," reports Remar. But they stayed on for eight days, and promised to return when things were more settled. They have already identified five men and women for the Fundamentals course, eager students who may eventually become Outreachers themselves. At first, the Marawi refugee men pictured above were shy about getting treatment, and only the women and children asked for tapping. But by day's end, the men too gathered under the trees for calming and de-stressing. One soldier reported afterwards, "This is the first time I've slept in weeks!" It was said that the child refugees, pictured above, took to Access "like ducks to water." 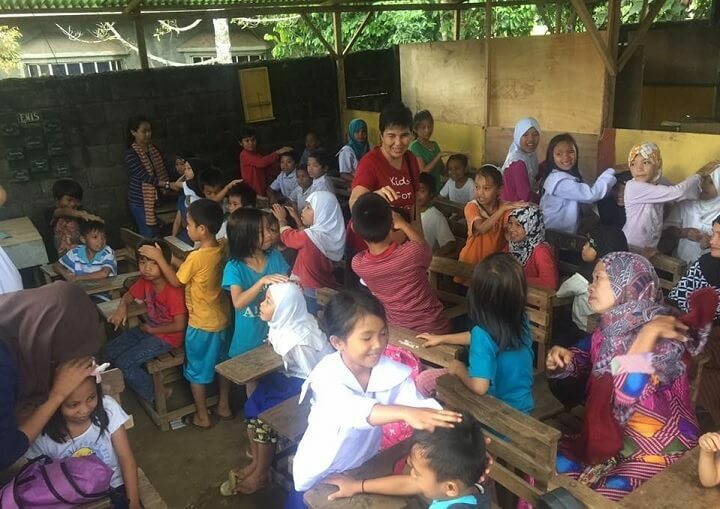 Kids for Peace, an NGO (non-profit, non-government organization) based in Mindanao, helped organize an Access workshop for the young refugees many of whom were highly traumatized by the intense fighting and steady stream of bombs in their home city. The Access techniques got the children--Muslims and Christians alike--helping to tap other children. The gathering benefitted from the Filipinos' strong sense of community, openness and creativity. Despite the hardships and horror of war, the refugees pictured above managed to pose for a group photo following their BodyTalk sessions. Their eyes shone, as they expressed gratitude for "elmo," which Remar says is "local dialect for 'deep knowledge,'" something that can never be lost. "This knowledge has no expiration date," they said, unlike the relief goods and drugs they may receive from the government's social welfare office. Thanks to the support of the IBA and the Be Healthy Foundation, the Outreachers have been able to further expand their work in the past year and a half! For more information on the team of individuals making Outreach work happen in the Philippines and Outreach work in general, refer to the following article, BodyTalk Access Outreach to Workers in Manila. Filipina Marilen Abesamis is a Certified BodyTalk Practitioner and promoter of BodyTalk in the Philippines. She currently resides in Florida. 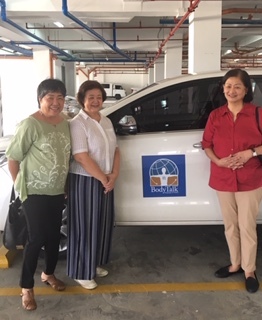 In the photo at right, Marilen (in green on the left) and Filipina Outreachers Annie Lao (center) and Gina Lee (right) pose with a new air-conditioned BodyTalk van that was donated by a businessman healed through BodyTalk sessions.